Ultrasonic Denture Cleaners - Which Ones Are Worth Looking At? As a dentist, I think ultrasonic denture cleaners are essential. I also believe that it's important to use one of the best ultrasonic cleaners. The good ones are EASILY the most effective way of making sure that your dentures are as clean as possible. An ultrasonic denture cleaner is basically a small tub containing a liquid, (usually water - but sometimes a special cleaning solution is recommended), which has high-frequency sound waves projected through it. The ultrasound within the liquid causes tiny bubbles to appear and collapse, very quickly, all through the liquid. This microscopic "bubbling" cleans the surfaces of anything placed in the tub. It's a small jacuzzi for your dentures! There are quite a few ultrasonic denture cleaners available. Some are designed specifically for dentures, while most are designed to be general purpose. The only thing special about the "denture-designed" ones is the size and shape. They are made just big enough to fit a set of dentures into, and tend to be oval in shape. However, I think that some of them are too small, and are not powerful enough to do a decent job. In addition, some manufacturers charge more for them just because they are a "medical device"! 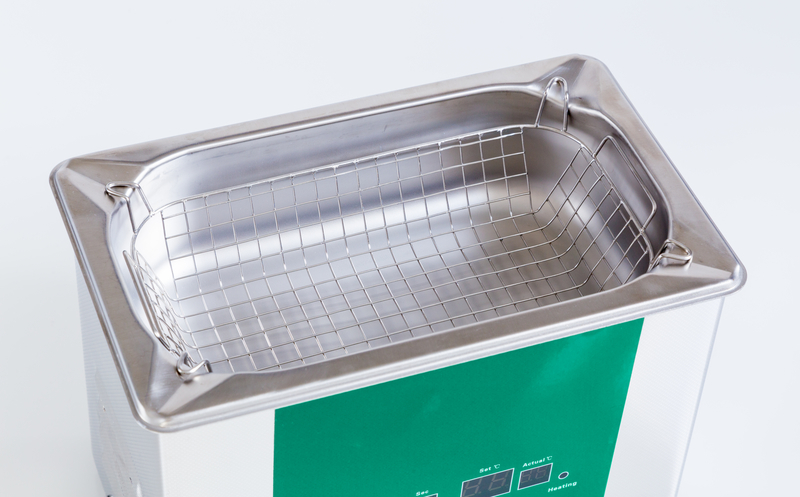 I have looked at A LOT of ultrasonic cleaners over my 30 years in dentistry, and I have selected JUST THREE units that I think are the best available at the moment. I can recommend them wholeheartedly. iSonic F3900. This is a very compact device, and quite light, so it's great for travel. The iSonic has a fixed 5 minute cycle, then it shuts down. It has a steel bath and a plastic tray to put your dentures or retainers into. Although it is mains-powered, so needs to be plugged in to a wall socket. Some people have reported being surprised by how loud it is, but in reality it's no louder than some sonic toothbrushes such as the Sonicare. The noise is mostly due to the frequency that it operates at, 42,000Hz. Does this matter? The higher the frequency of the soundwaves, the smaller and more penetrating the bubbles. So 42,000Hz is a relatively high frequency for an ultrasonic denture cleaner, and will penetrate into the tiniest spaces. Here's a link to a YouTube video that gives a demonstration of the iSonic. The presenter is from an anti-snoring device company - it's not me! But I like the presentation. Magnasonic. This operates at the same frequency as the iSonic above - 42,000Hz. This makes it just as efficient. Like the iSonic, it can operate with plain water. It has FIVE different cycles, ranging from 90 seconds to 480 seconds. It also has a steel tub, but has a slightly bigger capacity than the iSonic. The cleaning powder that is available with this device can be a little aggressive, however. I recommend using a drop of plain dishwash liquid. Branson 200. This is a more expensive option than the others above, at just over $100. However it is also bigger, with a more substantial build quality. The steel tank has thicker walls than the units already mentioned above, and so it will last longer. The ultrasonic waves DO corrode the walls of EVERY cleaner, and eventually the tank will perforate. The Branson B200 will last for years! Also, the bigger tank volume means that the ultrasonic waves can penetrate around your dentures better. It uses a slightly lower frequency, at 40,000 Hz, but this is a very efficient ultrasonic vibration for cleaning dentures. It works very well at getting all types of dentures clean, and helps to prevent stain building up. This is the Rolls Royce option. I think the the best one is definitely the Branson 200. If your budget can stretch to it, the Branson will give the most thorough cleaning. It will also last longer than any other cleaners I have seen, because it has the best construction quality. How do you clean dentures with an ultrasonic denture cleaner? First of all, you need to give your dentures a GOOD basic clean, as I describe here in How To Whiten Dentures. After you have cleaned your dentures with a brush, THEN you can put them in the ultrasonic tub. The dentures should be completely covered with water. It's important that no bits of the denture are sticking out above the water. Some ultrasonic denture cleaners recommend dissolving one of their cleaning tablets in the water, too. The chemicals in these tablets can help the ultrasonic action to remove bacteria, but if you have scrubbed your dentures beforehand with a brush, I don't think that additional chemicals are really needed. Now press the button to start the machine, and let it run through its cycle. This usually takes 5 minutes. After the machine has stopped, take your dentures out, rinse them well under the tap, and you're done! It's important to remember that ultrasonic denture cleaners do not replace the need to scrub your dentures with a brush - they are an extra step in getting your dentures really clean. You have to do both! For more information about looking after your dentures, go to Best Denture Products.